Japan has celebrated its first Mountain Day (Yama no Hi) national holiday by offering low-skilled foreign workers and Okinawans to an active volcano in southern Kyusuhu. 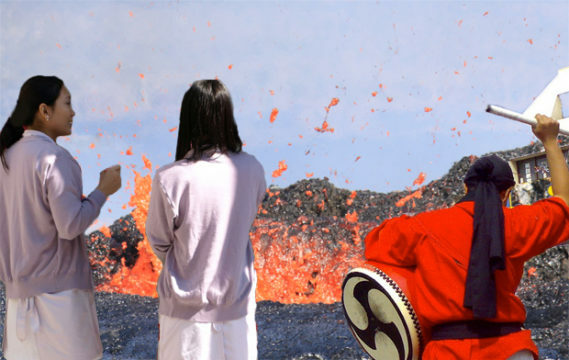 The inaugural “Burning of the low-skilled foreign workers and token Okinawans” ritual was a fun day for the family with little stalls selling takoyaki, toffee apples, and whole corncobs all the way up the side of Sakurajima volcano. “A couple of dozen underpaid foreign workers from South East Asia including some worthless interns and some token Okinawans were fed into the volcanic lava,” according to one festival organizer. Government officials were pleased with the turnout with thousands coming to support the sacrificial offerings of the less worthy. “It was a great success,” said one government official.